You may recall, in the review of the Transformers Classics Dirt Digger Mini-Con Team, that we said (two of) the vehicles in the set had real-world inspirations. It took the folks at Reprolabels to bring those inspirations to the surface, however. Oil Slick used to just be a generic '70s muscle car, but with the addition of a few stickers, we realize he's just a good ol' boy, never meanin' no harm; that he's making his way the only way he knows how; someday the mountain might get him, but the law never will. Yes, his altmode is now the General Lee, the southern-fried racer from The Dukes of Hazard. Five stickers are all it takes to make this change: a "01" for each door, and three portions of the Confederate flag for his roof (since the roof breaks apart to form the robot's feet). On their site, Reprolabels suggests some paint removal might be necessary, but since I didn't have any paint remover handy, I went without - the flag sticker covers up the Decepticon symbol just fine, so no worries there. His buddy Grindor was a little easier to predict: there are only so many black and green monster trucks, and by "there are only so many" we mean "there's only one": Grave Digger. The stickers used for this conversion are a little more complex, because they're not going onto flat surfaces. It's bad enough that it goes over the sculpted door handles and stuff, but the middle panel on each side (the part that says "Digger" in the photo over there) is being put onto a cylinder that's clearly unsuited for a sticker. I'm afraid it's going to fall off. This set uses typical stickers, too, not fancy vinyls like Knock Out got. The set includes two small Decepticon symbols - one in black and one in white - and two small red circles that we assume are meant to be tail lights, but they don't really seem to fit on either of the figures. Still, this set only costs $3, and it adds a huge cool factor to some dinky little figures. This entry was posted in blog exclusive review and tagged Reprolabels, Transformers. Bookmark the permalink. 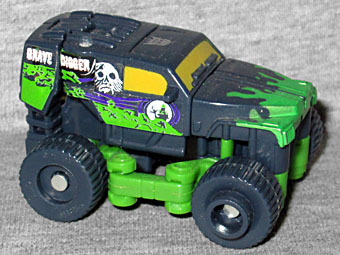 The little red stickers are Grave Digger's headlights.